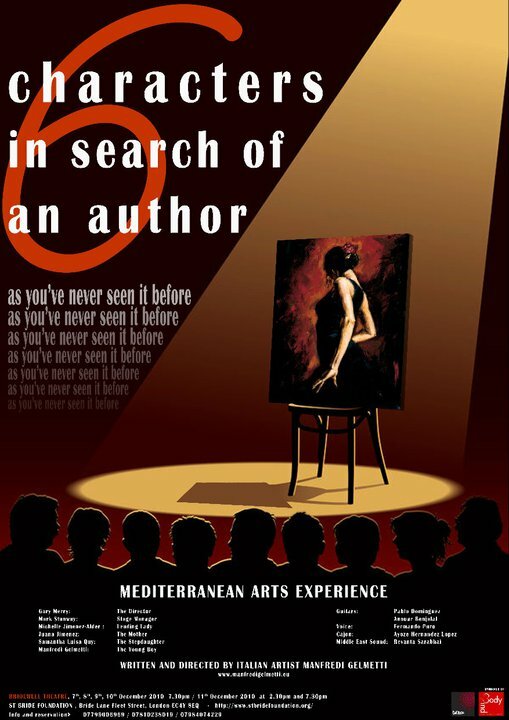 If ever there was a play looking for a flamenco treatment it is Pirandello’s Six Characters in Search of an Author. The cast of 11 at the premiere at the Bridewell Theatre near Fleet Street in December worked hard and pulled it off. On some of the coldest nights on record the atmosphere inside the theatre was one of warmth – despite the story – and emotion, involving both cast and audience. The cast was a mixture of actors, dancers and musicans; all played their part. The concept was that of male dancer Manfredi Gelmetti, from Italy, who has been resident in London since 2008. He both wrote and directed it. “My intention is to fuse my knowledge of acting, dancing and directing, to develop a method that can find a common language between Words, Flamenco Dance (a dance of passion, pain and joy) and Mediterranean Music,” he says. Manfredi’s background includes studies with Belen Maya, Farruquito, Rafael Campallo, Maria del Mar Moreno, Chiqui de Jerez, Manuel Betanzos, Marco Flores and Manuel Linan. He lived in Seville between 2004/2007 and returns each year to study and practice. Manfredi’s professionalism and creativity during the making of “A dos en un Tiempo” have created a script crafted with high sensitivity in both professional and human terms such as his capacity as Stage Director.